Shares of the rare-disease-focused biotech are down substantially from their recent highs. 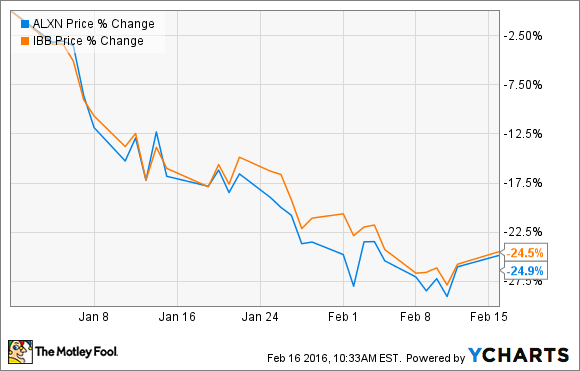 Here are two reasons to believe shares will rebound in 2016. Alexion Pharmaceuticals' (NASDAQ:ALXN) stock is off to a rough start for the year. The company's shares have traded right in lockstep with the biotech stock in general -- as measured by the iShares Nasdaq Biotechnology ETF -- and they have surrendered nearly 25% of their value since January 1st. Great companies always find a way to bounce back when their shares get slammed without a good reason, and I believe Alexion has what it takes to rebound. Below are two reasons Alexion's stock could rise from here. Alexion recently became more than just a one-drug company after it put two new rare disease drugs -- Strensiq and Kanuma -- up for sale. Neither of these drugs have had time to impact the company's final statements much -- Strensiq sales were only $12 million in the most recent quarter, and Kanuma didn't contribute at all -- but there is reason to believe that could change quickly. Management is forecasting that combined sales of these drugs will be between $150 million and $175 million for the full year, but that could be conservative guidance depending on how quickly the drugs ramp up sales. Analysts see peak sales potential for each of these drugs topping $1 billion. If Alexion's management team is purposely under-promising on sales so it can later over-deliver, then I could easily see its shares reacting positively. Biotech stocks tend to rise or fall drastically as companies provide investors with clinical updates from their pipelines, and Alexion should have at least four data readouts in 2016 that investors can look forward to. The first two relate to its blockbuster drug Soliris, which is currently being tested in late-stage trials for four additional clinical indications. The company plans on releasing clinical updates on two of its studies during the year. First is Alexion's PROTECT study of Soliris in Delayed Graft Function, a serious complication that can occur in organ transplantation. A second study it will be sharing data on is REGAIN, which looks at Soliris' use in refractory Myasthenia Gravis, a neurological disorder. Data from both are expected by the middle of the year. Beyond Soliris, investors should get clinical updates on two newer drugs in earlier-stage clinical trails that hold potential to be growth drivers in a few years' time. Alexion will be reporting data from its Phase 1/2 data of SBC-103, which is a potential enzyme replacement therapy being studied as a treatment for mucopolysaccharidosis IIIB, this coming March. The company will also give investors a look at data related to ALXN1007, a compound being studied in the rare Gastrointestinal Graft-versus-Host Disease. While it's unlikely all of the company's clinical updates from these trials will be positive, but just a few successes could be enough to reignite the company's share price. Alexion's management team has forecasted that its non-GAAP earnings per share for 2016 will land between $5.00 and $5.20, which includes a $0.31 hit due to expected currency translation. If the company can successfully deliver on its profit forecast -- and Alexion has a strong history of meeting or exceeding its guidance -- then its shares are currently trading hands for roughly 29 times the low end of its full-year guidance range. While value investors might be hard-pressed to call a multiple like that cheap, I think Alexion is a premium company that deserves a premium price tag. That's especially true when you consider that analysts believe Alexion will grow its bottom line by more than 20% annualized over the next five years. Biotech stocks are out of favor right now, which makes right now a great time to go bargain hunting for the strongest names in the bunch. With several catalysts on the horizon and a reasonable share price, I think growth-focused biotech investors should considering giving Alexion's shares a closer look.